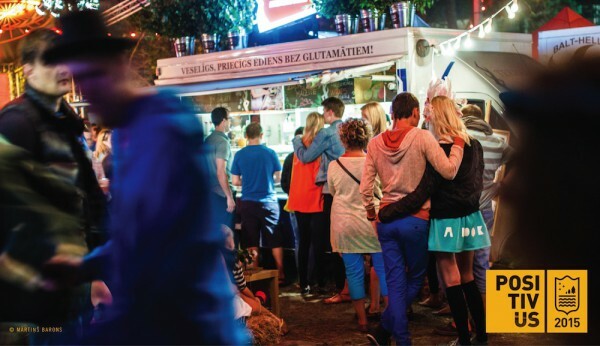 Positivus Festival’s catering application is now open. The festival organisers will once again offer visitors four catering areas - the main food court, camping site food court, Fresh Garden and Trailer Park. Baltic's biggest music event will be taking place from July 17th - 19th in Salacgrīva, for the ninth consecutive year. The Positivus Festival team will carefully assess each catering application regardless of submission order. A notable application will contain detailed and comprehensive information on the specific products, as well as visual aids - photos, pictures, etc. Ideally, the aesthetics and visual aspects of the catering stall will match the overall Festival mood. The Festival team is always looking for ways to improve catering quality and assortment; this year Positivus aims to introduce healthy global and local taste trends - biologic produce, locally grown food, raw foods, etc., right alongside beloved festival goodies. For additional foodie experience, last year’s Festival featured two new food zones - the US trailer park and the cosy vegetarian and slow food enthusiast harbour. Catering will also be provided at the traditional areas at the main food court and the camping site food court. Catering applications will be accepted until March 24th. More details on the application conditions are available here. Tickets are available at www.positivusfestival.com, in all Biļešu Serviss box offices and Nordea ATM’s (in Latvia only). A Positivus Festival 3 day ticket without camping costs EUR 65,00 and a 3 day ticket with camping costs EUR 71,00. A VIP ticket costs EUR 200. A separate camping site pass costs EUR 8. The 2015 Positivus Festival will be taking place in Salacgrīva for the ninth consecutive year. The festival’s main partner is Lattelecom, with support from Nordea and Tuborg. All the Festival news can be heard on radio SWH - the official Positivus Festival radio.